The very fact there are all these pages dedicated to Trump and we have no Libertarian, Constitutionist, Reform Party, Justice Party candidate threads speaks volumes. There is a portion of this forum where you can put in all the threads you want about these fantasy 3rd party candidates. Get busy and start typing. Versus voting for the 2 globalist parties and expecting changes. So it comes down to a few states---Florida, Pennsylvania, Ohio and a few others. Speaking from Pa. western part of state conservative Unfortunately Philadelphia/Allentown carries Pa. I agree with larsonstdoc . START ONE. A lot of states are like that. Western Iowa is conservative and Eastern Iowa is liberal. Eastern Iowa is where Iowa City is---the third highest concentration of homosexuals and lesbians in the USA. Western Washington state is liberal and Eastern Washington is conservative. Like I stated before rep/dem no difference, Did not Obama mention how bad the veterans are treated? The young men and women who choose to serve are defending the very rights and freedoms that allow Americans to speak out against government actions we oppose. They deserve our admiration, respect and enduring gratitude. At the same time, we must never forget that honoring this service and upholding these ideals requires more than saluting our veterans as they march by on Veterans Day or Memorial Day. It requires marching with them for the care and benefits they have earned It requires standing shoulder-to-shoulder with our veterans and their families after the guns fall silent and the cameras are turned off. At a time when we're facing the largest homecoming since the Second World War, the true test of our patriotism is whether we will serve our returning heroes as well as they've served us. When he(Trump) signed the pledge he signed up for whatever hes told to say to win. It does sound good, but he has to do what he is told now. What did Georgey porgie say about the vets..
No, I am not going to waste my vote on a 3rd Party candidate. Trump continue to gain Voters, everyday! ..all the younger folks [25-40] I speak with are going to Vote for Trump...and that is enough to send him to the White House! ..the folks in this are bracket are SICK of all the BS form the DC insiders and this time around they WILL make a BIG difference at the Voting Box. Reduce the population and reduce unemployment just like the Monarchs of old did. You know what America, all the CP ( www.constitutionparty.com )can do is offer you a better option but if you want to be manipulated yet again by the Nefilim and their Globalist kakistocrats then have at it. Fortunately the states will keep the Globalists restricted to DC. REALLY. Take it to the bank. I will not vote 3rd party this year-----Johnson, McKinney, Baldwin---all less than .0001 %er's. Still nobody here that has posted for these fantasy candidates. Go to 2016 Elections and start posting for them. You missed the point, why you said you would vote for trump, veterans and immigration, same message time and time again, Obama, George 2, and i'm sure Clinton and bush1 before them. I know the 3rd parties don't stand a chance in hell, but not much difference on wasting a vote. If nominated I expect Trump would win. But changes ? Can you prove Trump will be the same as the others on immigration and the VA? You can't. You can only speculate. Your reasoning is banal. Now will it get any Infowars News coverage ? Infowars has got its own studio and thanks to youtube they can cover the CP event and we can make it viral. He can only do what the party allows him to. I sure hope my speculation is wrong, My reasoning is based on the past 20 to 30 years dem or rep. no difference. Hell now that I think of it past 50 years at least for the vietnam vets. They might. There is someone here that knows who to email. I am not sure who it is. It could be MIA or TahoeBlue. Good luck. 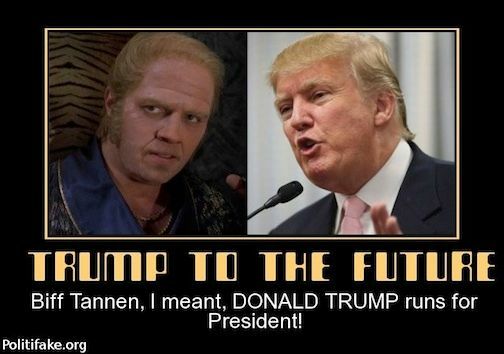 In the midst of celebrating the arrival of the future, one unbelievable tale has emerged: Back to the Future II actually predicted Donald Trump's current presidential campaign. 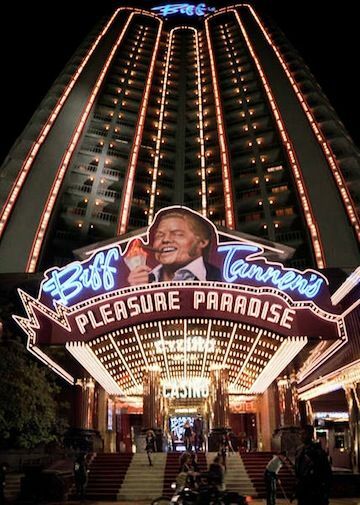 Back to the Future II screenwriter Bob Gale told the Daily Beast that Marty McFly's arch nemesis, the wealthy villain Biff Tannen, who turns his fortunes (among them, casino) into a quest for political power was...based on The Donald. True or not I do not know but worth thinking about. OVER THE PAST FEW DAYS AND WEEKS I HAD REFRAINED FROM SPEAKING ABOUT THE "TRUMP ANGLE." 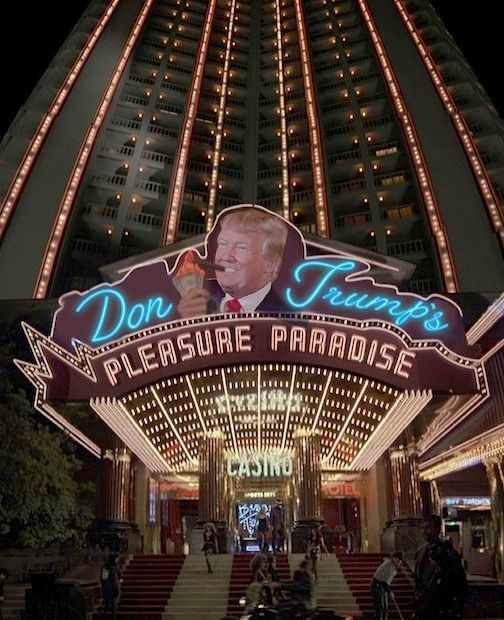 BY THIS I MEAN WHAT WAS THE ANGLE THE ILLUMINATI WERE HOPING TO ACHIEVE WITH HAVING TRUMP IN AS A CANDIDATE? WERE THEY HOPING TO DISTRACT? HOPING TO WIN? OR JUST HOPING TO TAKE VOTES AWAY FROM PEOPLE LIKE TED CRUZ AND RAND PAUL? INITIALLY I BELIEVED THAT IT WAS MORE LIKELY THAT HE WAS A DISTRACTION AND THAT HE WAS BEING PUT INTO PLACE TO DIVERT ATTENTION AWAY FROM THE LIKES OF THE TEA PARTY AND THEIR CANDIDATES, LIKE PAUL AND CRUZ. HE HAS DONE THIS AND MORE! TRUMP LIKES TO BRAG THAT HE DOESNT NEED "BIG MONEY" ELITES, BECAUSE HE CAN USE HIS OWN MONEY, AND THEREFORE HE WON'T BE UNDERMINED BY BIG MONEY INTERESTS. AND DOZENS OF OTHER ILLUMINATI ELITE TIES. THE FACT THAT ALL MEDIA OUTLETS ARE CONSTANTLY TALKING ABOUT HIM IS NO COINCIDENCE! WHETHER IT'S ON CNN, THE RUSH LIMBAUGH SHOW, THE MAIN NETWORKS, HE'S ON ALL OF THESE OUTLETS. FIRST OF ALL, THE ILLUMINATI KNOW AND ARE AWARE THAT PEOPLE IN THE MAJORITY ARE AWARE AND AWAKE AS TO THEIR USUAL PUPPETS. CLINTON, BUSH, GRAHAM, ETC. THEY REALIZE THAT THE MAJORITY OF THE PEOPLE KNOW WHO IT IS THAT THEY BACK, SO WHAT DO THEY DO? THEY SELECT A GUY LIKE TRUMP THAT IS NOT A LIFE LONG POLITICIAN AND SAYS ALL OF THE RIGHT SOUNDING THINGS. SECONDLY, REMEMBER THE HEGELIAN DIALECTIC! I HAVE TALKED ABOUT THIS DIALECTICAL FORMULA THAT THE ILLUMINATI USE FOR THE PAST 5 YEARS, AND WE ARE SEEING THIS FORMULA BEING USED PERFECTLY WITH TRUMP. HOW MIGHT YOU ASK? THINK ABOUT THIS, EVERYTIME TRUMP SPEAKS HE REFERENCES ALL OF THE THINGS THAT THE OBAMA ADMINISTRATION HAS PURPOSEFULLY DONE OVER THE PAST 7 YEARS THAT ARE EXTREMELY UNPOPULAR WITH THE MASSES. OBAMACARE, THE BAILOUTS, EXECUTIVE AMNESTY AND THE RELATED IMMIGRATION POLICY, BENGAHZI, AND NOW THE IRAN DEAL. ALSO, NOTE HOW HE'S CONSTANTLY SAYING, "I'M NOT POLITICALLY CORRECT!" THIS TOO IS BY DESIGN. IT'S ALMOST AS IF THE ILLUMINATI HAVE CAREFULLY RESEARCHED AND POLLED WHAT IT IS MOST PEOPLE ARE ANGRY ABOUT AND WHAT MANY PEOPLE CLAIM THEY ARE TIRED OF, AND THEN THEY HAVE TRUMP ADDRESS EVERY ONE OF THESE ISSUES. REMEMBER, THE ILLUMINATI PURPOSEFULLY ADVOCATE REALLY UNPOPULAR POLICIES THROUGH WHATEVER PUPPET IS IN OFFICE AT THE TIME, IN ORDER SO THAT WHEN THE NEXT PRESIDENTIAL PUPPET COMES ALONG, PEOPLE WILL VOTE FOR THAT PERSON BASED ON HIS PROMISES ABOUT REFORMING OR DOING AWAY WITH THE FORMER'S LAWS, POLICIES AND DEALS. THIS IS WHAT IS HAPPENING RIGHT NOW. ALSO, PAY VERY CLOSE ATTENTION TO WHAT TRUMP IS SAYING ABOUT MEXICO AND THE IRAN DEAL. THIS IS KEY IF YOU WANT TO UNDERSTAND HOW THE ILLUMINATI ARE SETTING HIM UP TO WIN. TRUMP IS HAMMERING MEXICO AND ILLEGAL IMMIGRATION FROM MEXICO. THE MAIN STREAM MEDIA DOES THEIR PART IN SUPPORTING TRUMP'S POSITIONS BY CONSTANTLY COVERING AND UNCOVERING STORIES REGARDING ILLEGAL IMMIGRANTS COMMITING ALL TYPES OF HEINOUS CRIMES. THIS IS ALL BY DESIGN. THE MORE HE TALKS ABOUT THIS ISSUE, THE MORE YOU HEAR ABOUT IT ON THE NEWS. ALSO, HE IS TALKING ABOUT WHAT A HORRIBLE DEAL THIS IRAN DEAL IS. THIS IS ALSO BY DESIGN BECAUSE WHAT IS GOING TO HAPPEN, IN ORDER TO SET HIM UP PERFECTLY TO HAVE THE RIGHT OF WAY ON THIS ISSUE IS THAT SOMETHING IS PLANNED TO OCCUR THAT WILL BE BLAMED ON THIS IRAN DEAL. THIS WILL ENABLE TRUMP TO SAY, "SEE, I TOLD YOU SO! I WAS RIGHT!" IT IS VERY EASY TO SEE HOW THE ILLUMINATI ARE SETTING UP THE T-BALLS FOR TRUMP TO KNOCK OUT OF THE BALL PARK. Exactly..... Go with the Constitution Party candidates. its called 'preaching to the converted' . 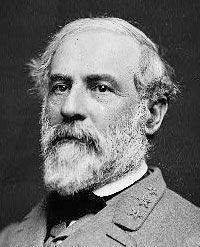 . .
to win an election the republican has to persuade people who Vote 4 Obama - to change sides. â€¦ he is ALREADY weilding a great power! GOP presidential front-runner Donald Trump claimed credit Sunday for Ford Motor Company's plans to move a production plant from Mexico to Ohio. Trump has been calling out Ford during his campaign, saying the automaker plans to move jobs from Michigan to Mexico, but Ohio Gov. John Kasich, who also is seeking the Republican presidential nomination, says the move from Mexico to Ohio had nothing to Trump's demands. â€¦ maybe a nice bit of coincidence. ENTIRE US motor industry returns! Donald Trump just might make a good President. Hillary is out of the question. We need to worry about local government where our vote and say, as The People, count. Just the idea that Trump talked about Ford helped in their decision. Yes, I believe that Trump will throw a penalty on these auto makers if they make their cars in China or elsewhere. Yes, Hillary is out of the question. She is eviler than Obama. At this moment in time there are only a few people that are electable by poll numbers---Hillary, Trump, Sanders, Carson and the dark horse Rubio. As time goes on 2 or three of these people will drop out. I don't see anybody else emerging from the pond scum. Why do the Latinos even care? Most of them don't even speak English. SNL is not going to dump Trump. They need the advertising money. FYI---The Los Angeles Times is a liberal rag that will side with Hillary---who is getting 90% of the money that Hollywood is spending on this election. Donald Trump is scheduled to host "Saturday Night Live" on Nov. 7, but if a growing chorus of critics have their way, he won't be. Latino advocacy groups, politicians and some media observers are calling for NBC to disinvite the tycoon turned reality TV star turned Republican presidential front-runner from the gig, citing inflammatory remarks Trump made about Mexican immigrants in the speech announcing his White House run in June.